What is Privacy? Why is it even important for us? First Post under the new Segment My Views. Today, I am going to write on a very interesting but somehow ignored term by many normal Internet users, and it is Privacy. Privacy is security, privacy is safety. If you don't take it seriously then it's a topic of a little bit (or more) attention. How? We are here for exactly that reason. We know what is Privacy and we know how to be secure in this world becoming over-transparent, over-insecure (in terms of the Internet). Are they the questions or even thoughts just crossed through your mind as I said, "I'll talk about Privacy over the Internet"? Might have! Privacy is not something that me or you going to read in some social media or any type of website's Privacy Policies and then, one would say, Yah, I understood all, they are not taking any single coin from my pocket! Done! But No, It's more sensible and much deeper thinkable point than we can even imagine. One should understand what is privacy and even if we completely read out the Policies and Terms, doesn't mean we are not likely to be at any risk. We should understand what we are sharing and how they can be used. Let me start talking about this arguably big, real threatening, very important and sensitive topic using some major points and in the end, we are supposed to find out why Privacy is important for us, Is Your Privacy Secure, Good and the ways we can make our Privacy better and secure, How Privacy exists in our Internet Life (Or does not! who knows?). In simple words, Privacy is something that makes any individual keep themselves and their individuality, information safe and up to them and not compromised or shared without the permission of that individual. It is all about self-identity, personal information/data, public information/data can also be enlisted if they are not wanted to be shared with someone or somewhere specific. By saying information or data, it could be anything, for instance, it could be your bank account number, your credit/debit card information, your passwords on important sites and services, your or going to very personal things, your likes/dislikes, your crush, even your sexual orientation. They all come under your private data and to keep them safe, Privacy should be concerned. Privacy is an essential part of life and mostly the internet is the one making it weaker to keep in the safe-box. What Am I sharing (Un)Knowingly And How My Privacy Can Be Compromised? Well, In today's time stamp, we're a real and very loyal Internet Lover. Every day we share our personal or public data over the internet while surfing through or using several websites for several reasons, and How? By Cookies, the data and traces we leave behind. Sometimes we care and tighten it and delete them, Sometimes not. But cookies are not bad, they are for good purpose, they make the pages load faster, our passwords and other details that we enter in are saved to provide us with all that as quickly as we need them back on the spot. Why only surfing the Internet, even in other ways we might be putting our privacy at risk, they are by using several kinds of services like mentioned above. However, all of them take privacy very seriously and provides Policies that ensure a better Privacy but still what We are sharing is my concern. And Who knows how that Privacy Policies can still give ways to use your data without even of your understanding. Facebook(Social Media Sites): Sharing pictures, plans or events on Facebook, liking posts and news. Hey, Even Your Identity, Places you lived and currently living at, Your Educational and Work Present/History. Even Where you Partying tonight or Your very favorite Tech Conference at some hall or place. Isn't it scary? that all your information about your life, what you did and what you are about to do is available publicly and anyone can use it. Online Image Sharing Apps/Sites: Using Instagram, Google Photos or similar kind of service We are sharing thousands of pictures.Even if you are saving them on Clouds. We are sharing it. What We Love To Watch: Using YouTube, I'm giving all the details that what I like to watch or What I really don't or Hate. Online Bank and Wallet Services: Using PayPal or any online banking and Wallet apps and services, I'm storing my banking data digitally and giving them out to other third-party service providers than our real Bank. My All transactions can be tracked and can be calculated where I spend or from where I really getting money. It is even possible by all those transaction patterns to deduce your Annual or Monthly income. People Around Me: Using Google+ or Google's Hangout service we are easily vulnerable to provide the data with complete awareness that the people, in our circle and Who and What type of People are in our circles. Our Family, Friends, and Colleagues all information is there. 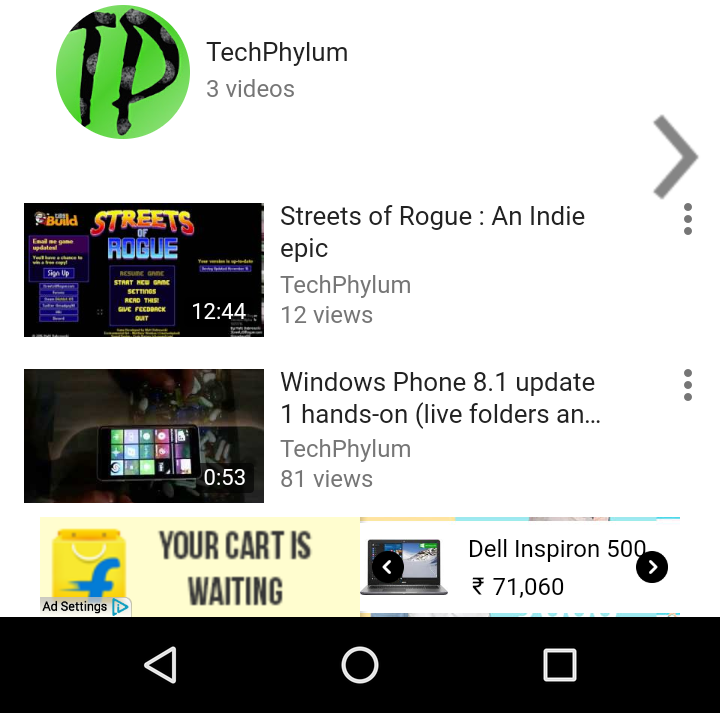 In this Screenshot, You can see a third party app had an ad at the bottom showing what was inside my Kart on Flipkart. Alright! How did that third party come to know what was inside my Kart? GPS maps/Geo-Location services: All these services are always storing my locations and if I use navigational directions then they can easily know where am I going dinner tonight, where did I pick my cab and where I reached.Hmm, Interesting. And even if You say that you don't really use the map and similar GPS services then the websites, apps and search engine that you use always get your geo-locations by your IPs and ISPs.And I've seen many apps that they even don't work without Location Permission. Cloud Storages: Clouds are the places where we share our Documents, Files, Pictures, Videos, Even Phone Contacts, and Messages are being back up on cloud storages. Sometimes we share important and sensitive data and information over the clouds. All are there at one place folder and with nice file and folder name with description. 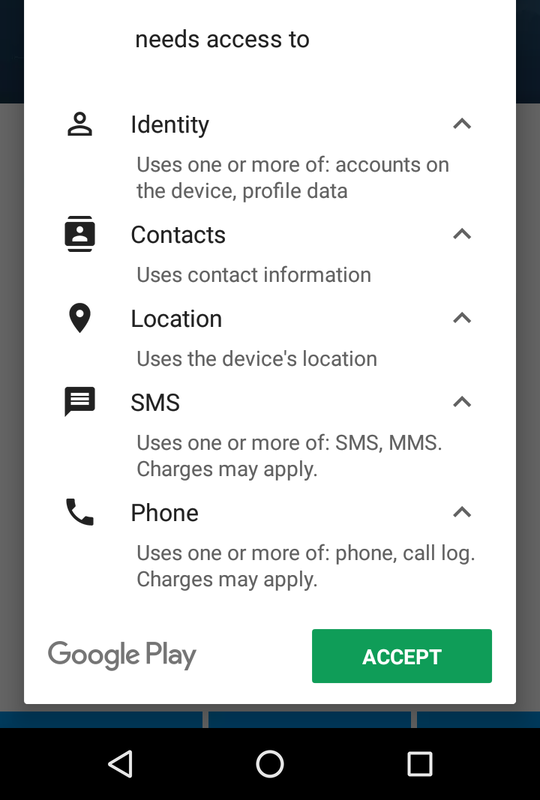 Apps: The apps that we install on our mobile Phones asks for Permissions at the time of installation, Have You ever seen what permissions are they? How and Even Why they want to access to all those permissions asked? 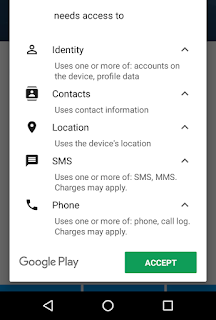 Many Apps asks for Files/Folders access, Phone Contacts, SMS, Call Logs access.I'm not saying all apps are gonna steal that information and likely to sell or buy those data. Most apps and services take Privacy very seriously but what if we allow the Fraud app, unnecessary and sensitive data access? Many Apps which blocks calls and messages have full access to your contacts, that is how, even after not being registered on phone number identification apps, We still see the name of the caller who has no account on that app. Where from they got the information about that number? Of course, someone else gave it access to his/her contacts and they got all the numbers with names. Today with the vision and charm of futuristic gadgets, we are so fond of them and We(even I) want to use all those cool stuff You know. Like coming from work at night, Locked Doors opening by my Fingerprint and Iris scan or DNA(Futuristic, You Know!) and as I entered the room, My Computer Home Bot turned the lights and Air-Conditioner on and will ask in a ROBOTIC-VOICE, Welcome Manoj, And will ask me my needs, that if I want to take a Warm Shower or Should It prepare the bed and dim lights for my sleep. Interesting? Well, Some of them are already in our life, now a common part of our Life. You must have used or seen a Mobile Phone having FingerPrint sensor lock, Iris Scanner for the same and Voice Assistants like Cortana, Siri, Google Assistant. They might seem very useful but aren't they also storing our biometric data at the same time? Our FingerPrint, Our Iris Scan, our voice pattern and voice tone and I forgot to mention those Smart Watches always tracking our pulse rate and movement with every step of our feet. If ever my phone gets hacked or even the database where all my biometric data is saved, just imagine how badly those data can be misused. So What Have I Shared Till Now? If all the services mentioned above are already being used by you then till now you have shared....., Wait! Let's make a simple list of them. Who You are, Where You lived/living and all history of where have you traveled, where you been hanging out with friends and had been. Where from you did your schooling, What is Your Educational Status, What is your work history and current status. Your Files(Important/Normal), Photos, Documents, Passwords(Saved in some third-party app or file or even your browser), Any file or folder I have on my computer, Mobile Phone or Tablet. What People are around me, Who are my family/friends/close friends. Remember just by using some calculation, some third party sites predict who is Your Best Friend just by watching at the data of your social profile? Maths and Codes! They are powerful. My Geo-location, My Current Location, My past location and Even future locations where I am about to go. My Bank Details, My Contact Details, My Likes/Dislikes, Even my sexual Orientation can be calculated based on my internet history. Most importantly, My biometric data. In India, We have Aadhaar, which is a completely biometric-based unique Identity Number for every Indian. Rest......You know it well what is at risk if biometric data saved on mobile phone devices and other electronic devices get compromised. All these data is enough to be used against you if they are either stolen and sold or get hacked. Companies are just opening their big mouths and want to get all these important data. By selling your data one earns money and by buying those data and using those data's stats they serve you their services and make money. What Is At Risk And What Could Possibly Go Wrong, If I Don't Go For A Better Privacy? Well, being frank any data we share on the Internet can be used for either our good or bad or I should say Worst. It's all up to who has our data access. The worst things that we can consider is either our Data Security is compromised and all the data is stolen or Second to that our data is sold by companies. Well, even If we have read all the Privacy Policies and Terms&Conditions, We still can't say we know all about how our data is to be used, we are just giving it to third parties' hands. Even after following all the Laws and Policies, We are still not safe. In all those cases too, data and information can still be used in such an unexpected way that is legal and up to the policy mark too. Companies are willingly interested in buying the information about the users, What are Likes & Dislikes, What they use and Contact Details and Personal Information are at the top. Everyday Some people at some place get hacked, What next? Data Theft and then sold or worse is Bank Account and Amount is compromised.No information on the Internet is 100% safe, Hackers are there with less blinking eyes to how they can get and use the data. Even if all the companies and service providers go fair with their Policies then hacking is a serious impact on our Privacy. Who has access to my Private Data and My personal information? Service Providers over the Internet, say Google, Facebook, Twitter, Any kind of website providing several services, Maps, Cloud Storages and so on. They all are the people on whom we believe that they are going to keep our Privacy safe. The software is not a different tag from the tag list of the subtitle. Our Operating System has all the apps with their data and the data stored and processing on our hardware. That was the first reason I took so much time in switching from Symbian to Android.I never wanted to share my location, what apps do I use, what I use and what I don't. Well, sadly Symbian died( A Very sad moment for me) and I made an early switch to my first Android Phone, Samsung Galaxy S5. That is why I really appreciate Linux and all those hard working developers keeping alive and releasing several open-source software and services. At least, I have control over it and they even collect the data but they mostly use it for the betterment of their great piece of Open-Source software. So, I might be looked like a hypocrite or I might have said too much intense but what I wanted to make clear here is What are we sharing, What could possibly go wrong, what is at risk and overall understanding the term 'Privacy' and to make Privacy better are my main motto of this post. Not only Companies should take Privacy seriously but also the users should be vigilant about the data they are sharing and should not share on the Internet. I'm not really saying that we should stop using all the services as It'll lead to misuse of your data, You should become anonymous, throw your phone away, stop using the internet and go into a cave to live the rest of your life and live there to be safe and to keep your privacy safe. That is all just nonsense. Use all of them, most of the companies take Privacy and Security very very seriously and most of the reputed and the companies serious about users and about their information security, are not likely to sell your data in any way. All I wanted to say here is Knowledge about Privacy and What we are sharing and how they can be misused. Just try to understand the value of Your Identity and that is your step to better Privacy. So, It is getting too long and Still, I've to write about how to make our Privacy and Security better, I'm postponing it to the next part.